Things have changed. The days where it didn’t matter whether you were fat or thin, ugly or pretty, shy or confident, and so on, have disappeared. People are judged nowadays. Just because someone is skinny doesn’t mean they have an eating disorder. Just because someone is fat doesn’t mean they are greedy. And just because you think someone is ugly, doesn’t mean you’re right. That is your opinion… to somebody else they could be the most beautiful person in the world. Why judge people? You don’t know what people are going through, or have been through, so rather than judging somebody by their outside appearances, get to know the real person on the inside and accept them for who they are. Nobody likes a bully. 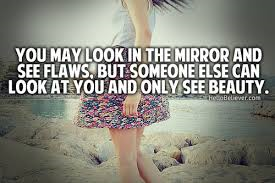 In my opinion, everybody is beautiful in there own way. Self-acceptance is probably the hardest struggle we face, but it’s great once you learn to accept who you are! I’ve written a few posts on self-image you may find interesting/relateable. Feel free to check it out. You have literally spoken my mind!